The Miles Hawk Major was a 1930s British two-seat light monoplane designed by Miles Aircraft Limited. The Hawk Major was designed as a successor to the Miles Hawk by F.G. Miles. Main changes were a de Havilland Gipsy III engine, metal (instead of wood) engine mount, and trousered undercarriage. The prototype (designated M.2F Hawk Major) was first flown in 1934 and went on to second plane in the 1934 King's Cup Race at an average speed of 147.78 mph. 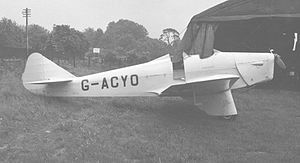 A racing version was developed as the one-off single-seat M.2E Gipsy Six Hawk with a 200 hp de Havilland Gipsy Six engine. The production Hawk Major had the 130 hp de Havilland Gipsy Major engine. The aircraft sold well to private owners, including two that were fitted with smoke generators to allow them to be used as skywriters. An improved version (the M.2H) with a trailing edge flap replaced the M.2F on the production line. A number of special one-off racing versions were also built. In 1936 Miles Hawk VI, G-ADOD was entered into the Schlesinger Race from Portsmouth to Johannesburg and flown by A. E. Clouston who nearly made it all the way to Johannesburg but had to make a forced crash landing due to engine trouble 150 miles south of Salisbury. In 1935 an improved version for training use was developed as the Miles Hawk Trainer. M.2E Gipsy Six Hawk (later Hawk Speed Six) Single-seat racing version powered by a 200 hp de Havilland Gipsy Six engine, one built. M.2F Hawk Major Production version powered by a de Havilland Gipsy Major engine. M.2G Hawk Major Three-seat cabin version, one built. M.2H Hawk Major Production version powered by a de Havilland Gipsy Major engine. M.2L Hawk Speed Six Powered by a 200 hp de Havilland Gipsy Six 1F engine, one built M.2M Hawk Major Three-seat version powered by a de Havilland Gipsy Major engine, two built. M.2P Hawk Major Dual control version powered by a de Havilland Gipsy Major engine, three built. M.2R Hawk Major de Luxe Racing version powered by a de Havilland Gipsy Major engine, two built. M.2S Long-range version Powered by a 150 hp Blackburn Cirrus Major engine M.2T Long-range single-seater powered by 150 hp Blackburn Cirrus Major engine, two built. M.2U Hawk Speed Six Racing version powered by a de Havilland Gipsy Major Six R engine, one built. M.2L Speed Six registered G-ADGP is airworthy in 2009 and based at White Waltham Airfield near Maidenhead, Berkshire. Jackson, A.J. British Civil Aircraft since 1919, Volume 3. London: Putnam & Company Ltd., 1974. ISBN 0-370-10014-X. Miles Hawk Major Pictures and Miles Hawk Major for Sale.